Which Brands Are Winning The Social Conversation At Baselworld 2017? To mark this years Baselworld Watch and Jewellery show we've compiled a special piece of analysis to identify the brands who have captured audiences attention in the run up to the event. First of all we looked at the brand conversation share so far - and as you can see Italian brand Bulgari are seeing by far the largest share relation to the event, just over 50% of all conversations we tracked in fact. Other brands leading here included Rolex, who normally see a large share of global social media and online conversation about luxury watches and Tag Heuer who announced their latest innovation, the Connected Modular 45 smartwatch in the run up to the event. 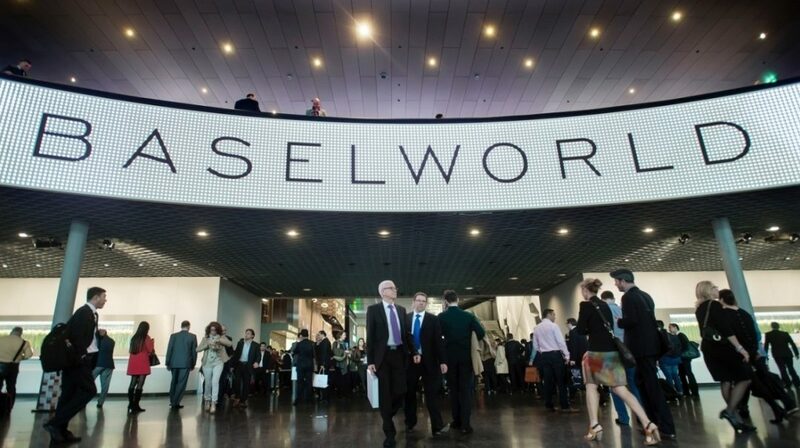 One of the most curious learnings here is that brands who do not feature at Baselworld are still seeing a share of conversation. Initial analysis of this suggests they are being referenced in relation to the event by social audiences in spite of this, especially as a result of a behaviour we often see (especially on Instagram) where audiences include multiple luxury brands using hashtags. The reasons for Bulgari's impact here becomes clearer when we look at the geographical data behind the audiences who are talking about the brands presence at Baselworld. 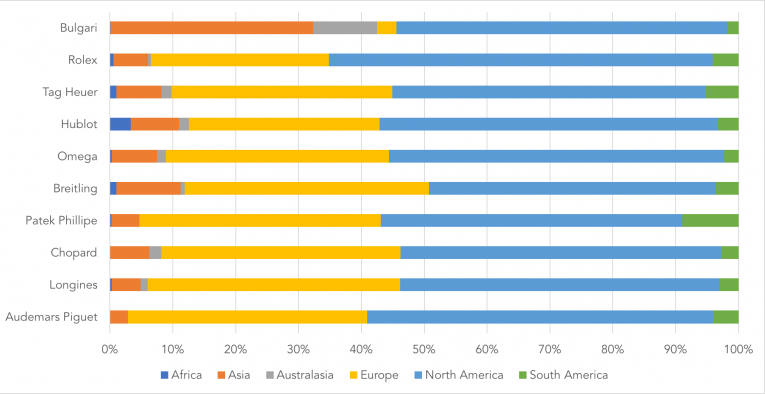 As you can see in the graph below, in addition to the U.S a large share of this conversation comes from Asia and a second smaller share from Australasia. This is the result of celebrity partnership with Chinese-Canadian pop star Kris Wu which has successfully engaged a young, Asian audience which is very active on social media and as a result has contributed a great deal to boosting the brands visibility in relation to Baselworld and beyond. Whilst higher volumes of conversation are of course beneficial for brands it is the audiences sentiment towards them that can help us to understand how they are being perceived - as well as often providing the means to measure advocacy in the form of positive sentiment and potential reputational risks in the form of negative sentiment. 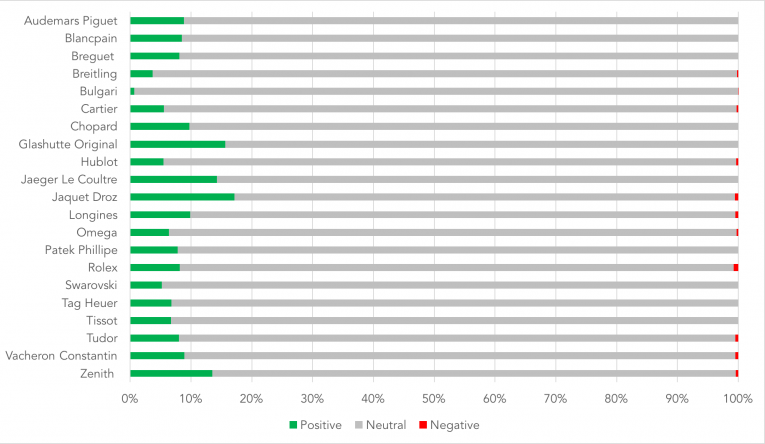 In the case of the brands we identified sentiment for at Baselworld 2017, it is actually some of the smaller brands such as Jaquet Droz and Glashütte Original who are seeing the larger shares of positive sentiment - which suggests audiences are responding well to their communications around the event. Thankfully none of the brands we analysed here are showing the kind of negative sentiment which would infer any kind of reputational risk.